Sporty styling and a big boot! 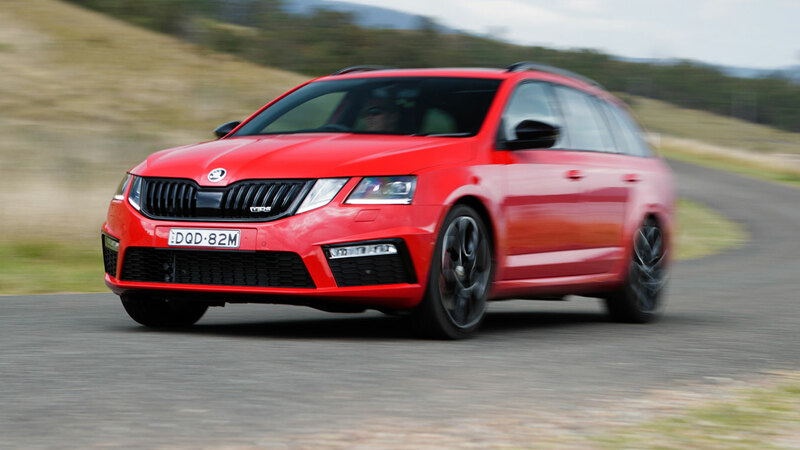 The Skoda Octavia would not be an obvious BabyDrive in today's climate of family SUVs. 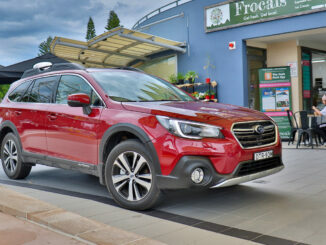 However, pre-SUVs wagons were the family car of choice! 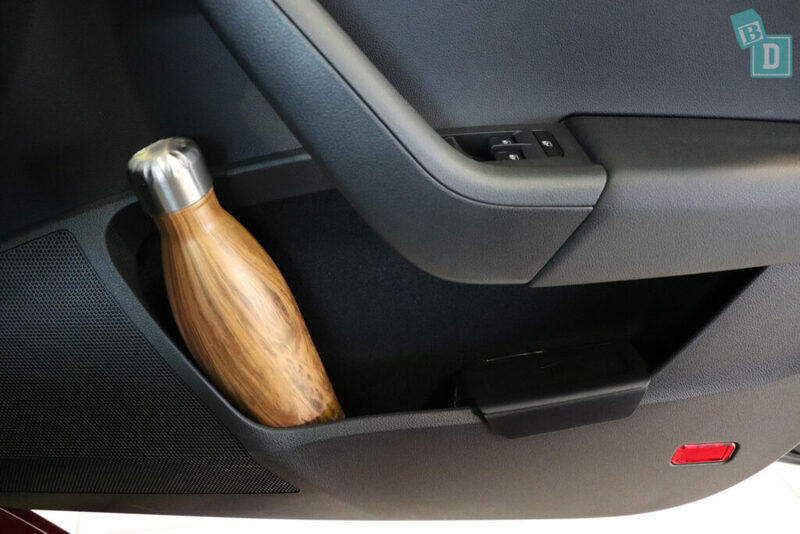 The Octavia is very practical in terms of boot space and there are some nice thoughtful little Skoda features in there like space dividers, a torch, an umbrella etc. 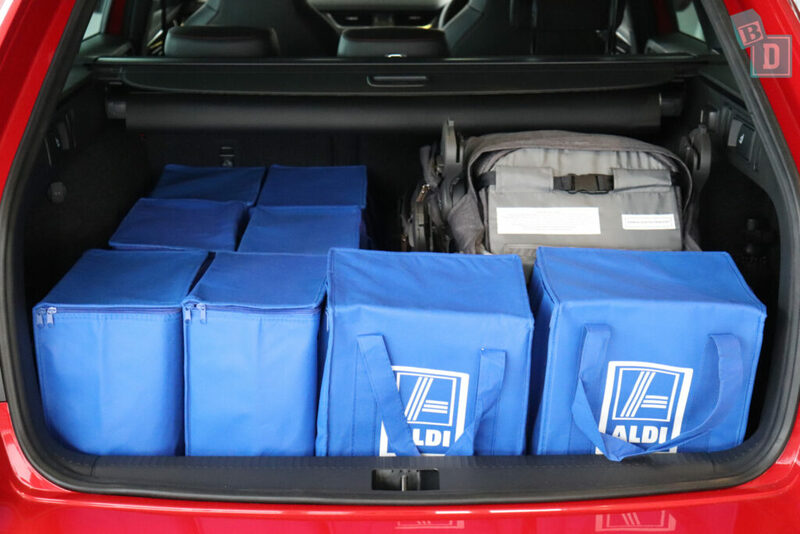 Empty the boot would hold 15 shopping bags! Or the Mountain Buggy Duet twin stroller and four bags. 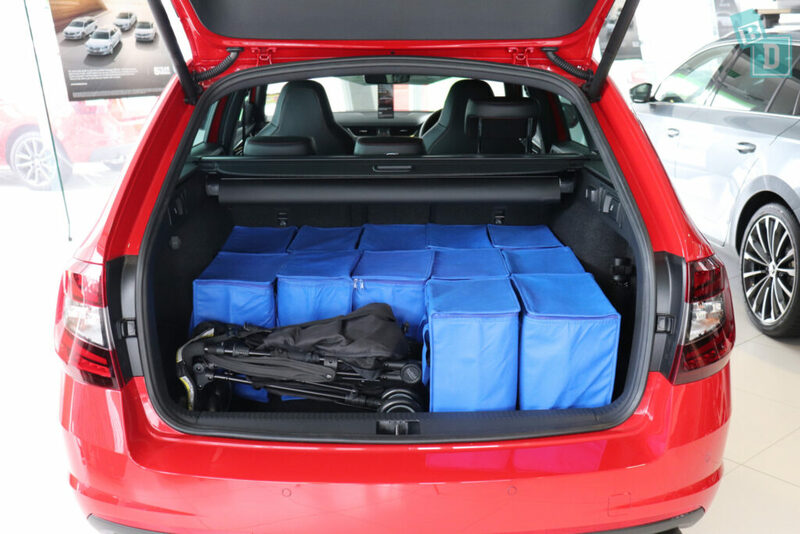 Both the Britax Flexx tandem and single strollers fitted with eight shopping bags. The Britax Holiday compact stroller fitted with 12 shopping bags. 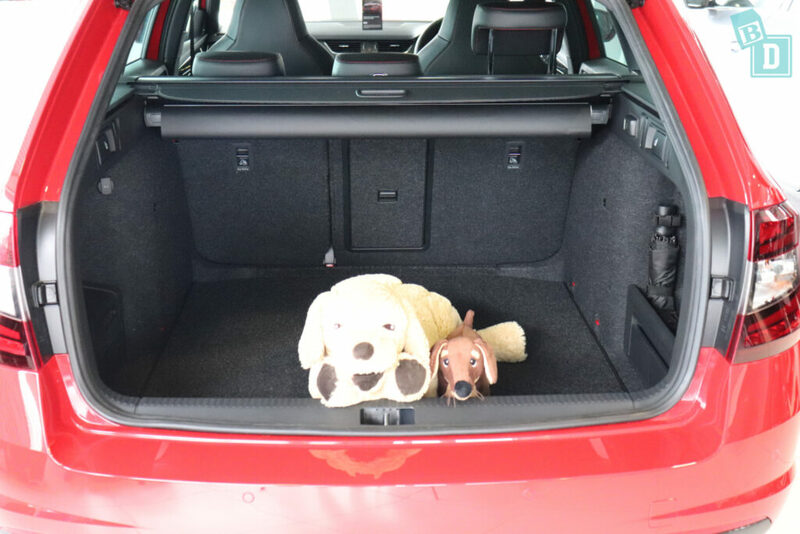 Or you could easily get a large family dog in the boot!! Space was okay inside the cabin too. 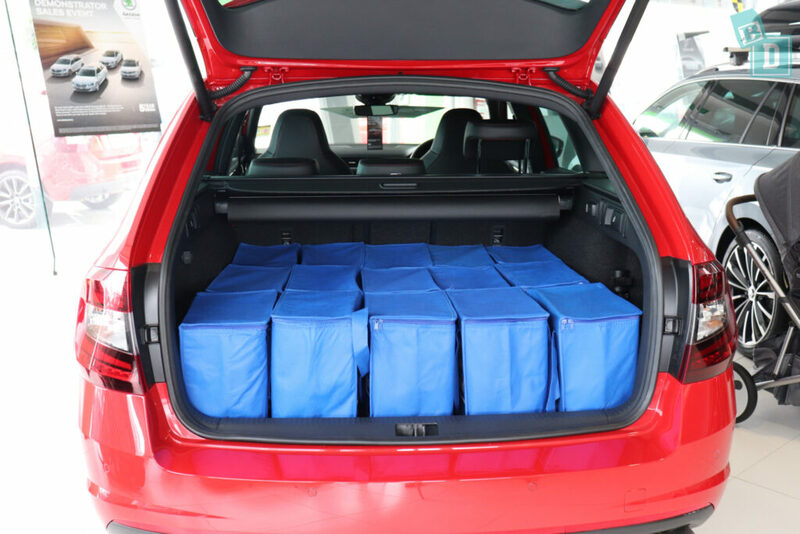 There are two ISO Fix, one in each of the rear outer seats, within plastic guides and really easy to connect to. There are top tethers in all three rear seats. The outer seats have the tethers in their seatbacks but in the central seat it is located behind the headrest and is really difficult to connect to because the headrest only lifts up 2cm! I could install two child seats in the Octavia in the outer seats. I installed the rear-facing Britax Unity infant capsule and the Britax Graphene (rear facing). Installation was quite simple but I found I could not reach the top tethers through the boot because it was far too deep, so I had to bring the backrests forward to attach the top tethers! Aesthetically the Octavia felt like I was driving around in an 80's boys bedroom, with quilted grey suede, and red and black trims! Not really my thing but I'm sure the intended consumer appreciates it and the red trim sat nicely with the red exterior paintwork. The Octavia was a nice car to drive but had quite a hard and sporty feel which I think would be quite jostling for young passengers. The media screen and reversing camera had nice crisp and clear images, were modern to use and easy to navigate. The Skoda Octavia scored a five-star ANCAP safety rating in 2016. In the boot of the Octavia, I could get 15 shopping bags from empty. 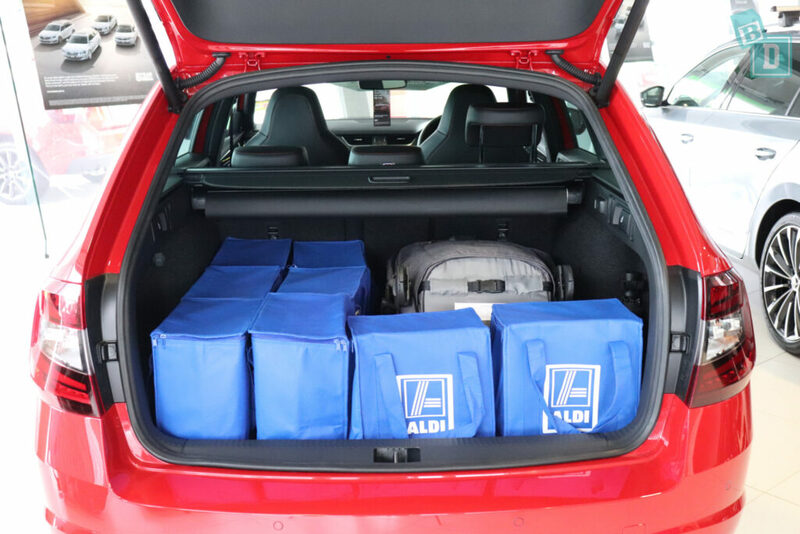 The boot is a big square shape as it fits three rows of five bags. There is a storage well on one side with an umbrella in it and plastic dividers that velcro to the carpet floor so you can hold something in place like a ball, cake or lunchbox for example. The boot also has a torch in the side of it that you can remove and use or leave as the boot light and there is a 12V socket there too. With the Mountain Buggy Duet twin stroller in the boot, I can get four shopping bags in with it, lengthways and widthways. With the Britax Flexx tandem stroller in the boot, I can fit eight shopping bags. I can also fit eight bags with the Britax Flexx single stroller. 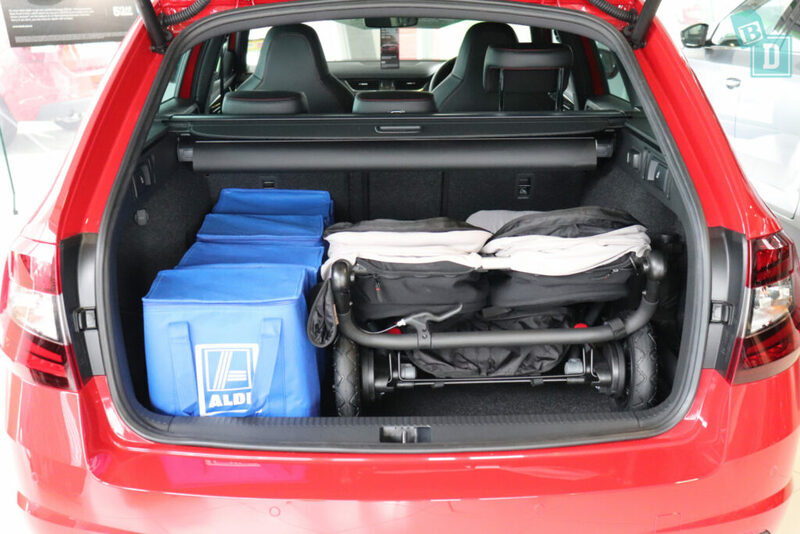 With the Britax Holiday compact stroller in the boot, I can fit 12 shopping bags. Or the boot would fit a large dog. Storage in the front of the cabin was quite limited but organised!! The front door bins will hold a large refillable water bottle and there is a little plastic bin in there for rubbish, which is a nice feature as lets face it that's what most of us fill our door bins with!! 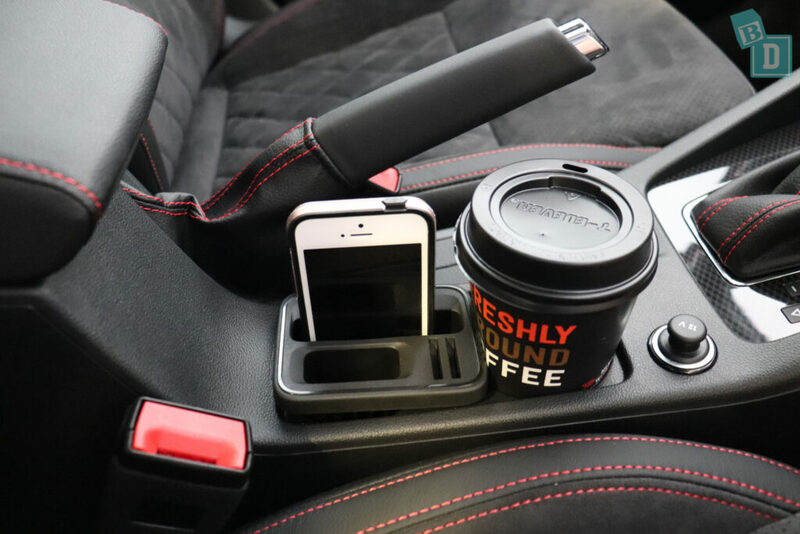 There are two cup holders in the central console that are good for holding a disposable or reusable coffee cup.There is a little phone, key and coin holder in one of the cup holders, which is a well designed little gadget. 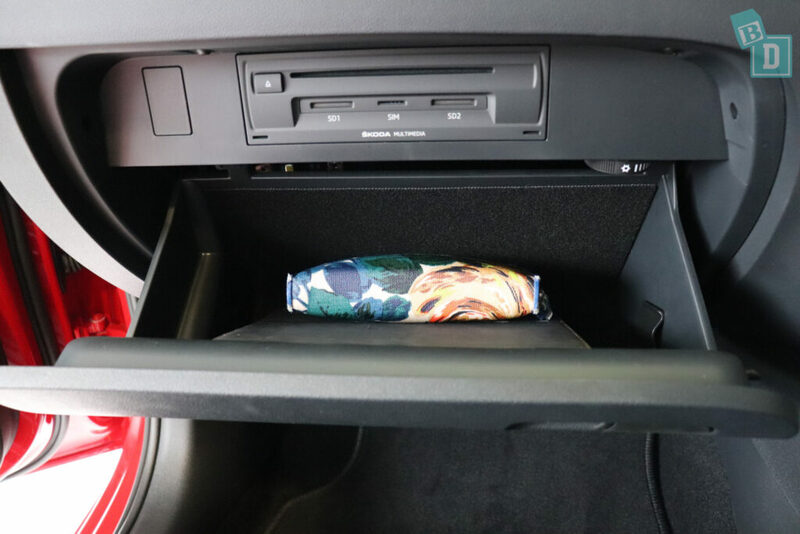 The central console storage box is small with a lining to stop things in there making noise when driving around. 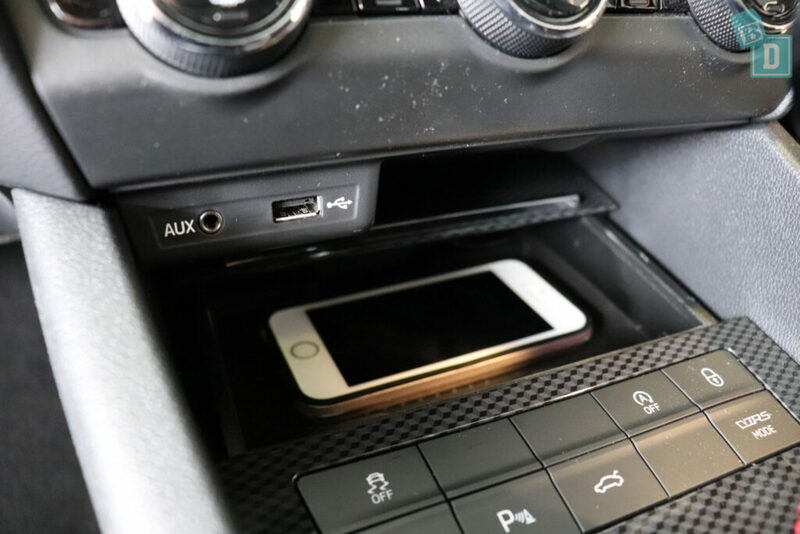 There is a wireless phone charging well in front of the gear lever, there is also a AUX and USB socket there too. 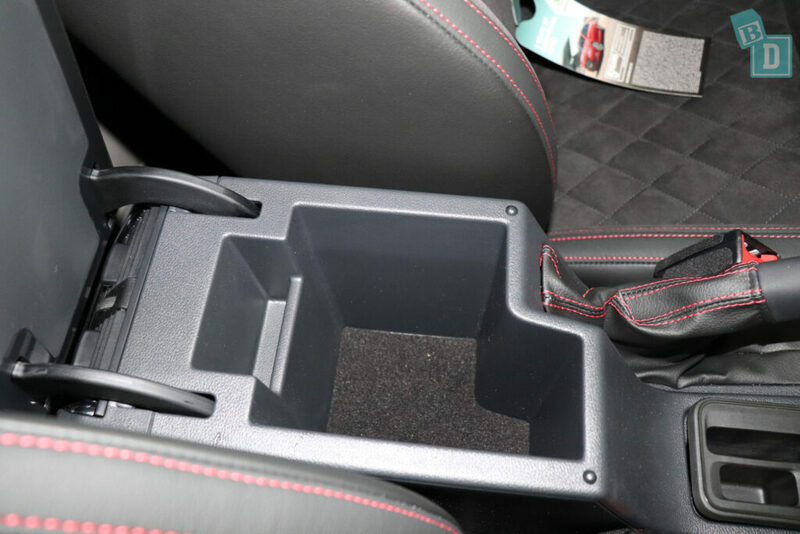 The glove box would just hold my iPad and wallet and it also has a cooling feature so you can use it like a little Esky! 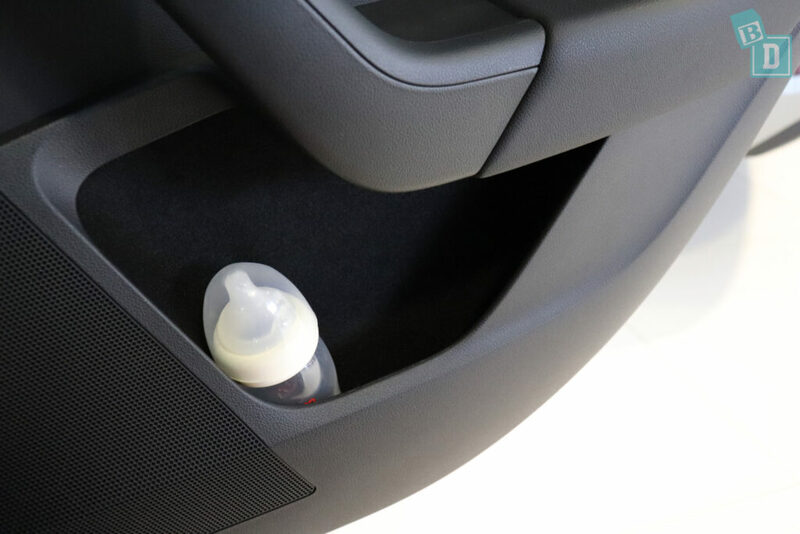 Storage is poor in the back as the door bins are smaller and would just hold a 600ml or Pigeon baby bottle. There are two cup holders in a fold-down armrest in the central seat back and that's it for the rear passengers apart froma tiny ashtray! 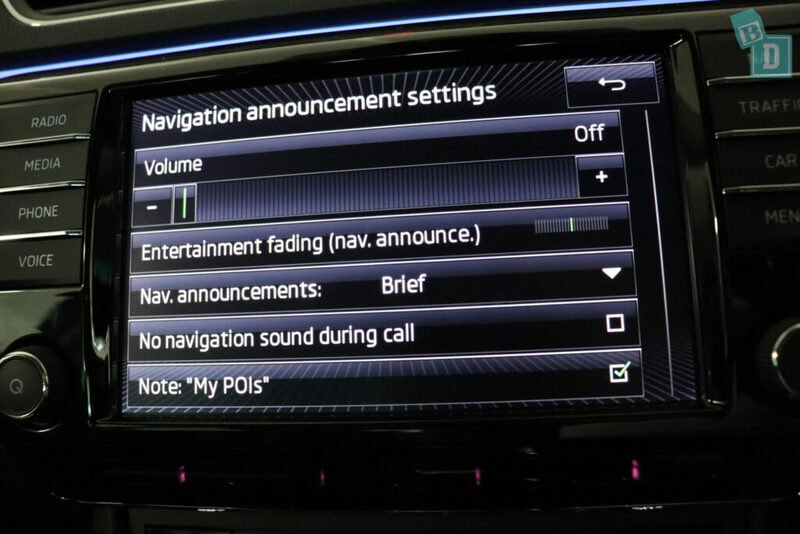 You can adjust the volume of the parking sensors but not turn them off completely. You have to go into the settings to do this as the option is not directly available on the sensor screen. 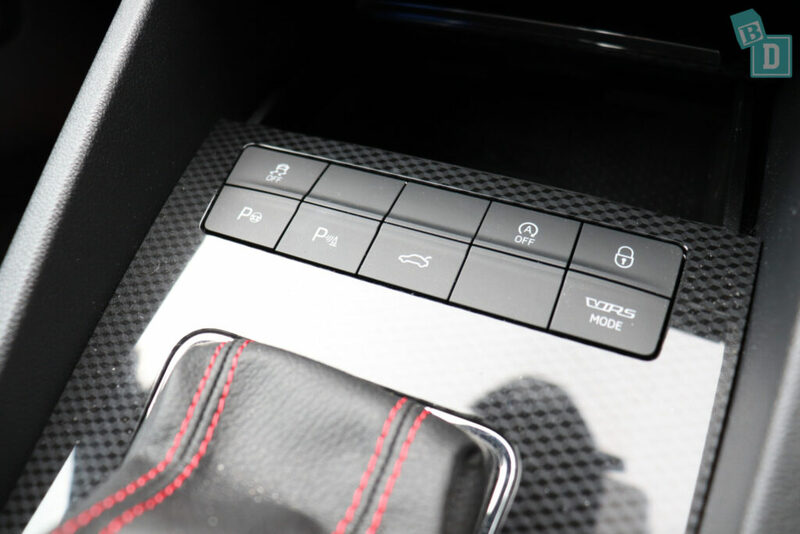 The button to turn on and off the auto engine cut out, parking sensors, boot opening and door locks are positioned in a panel in front of the gear lever. The media system has a clear and crisp screen with a good reversing camera image. The indicators are not too noisy, they have quite a dull tick-tock sound that I don't think would disturb a sleeping child. You have to delve quite deeply into the media screen settings to adjust the sat-nav announcement volume, which I didn't find very practical as a BabyDrive. I would have liked a simple volume or mute button on the sat-nav screen that allowed you to do it. 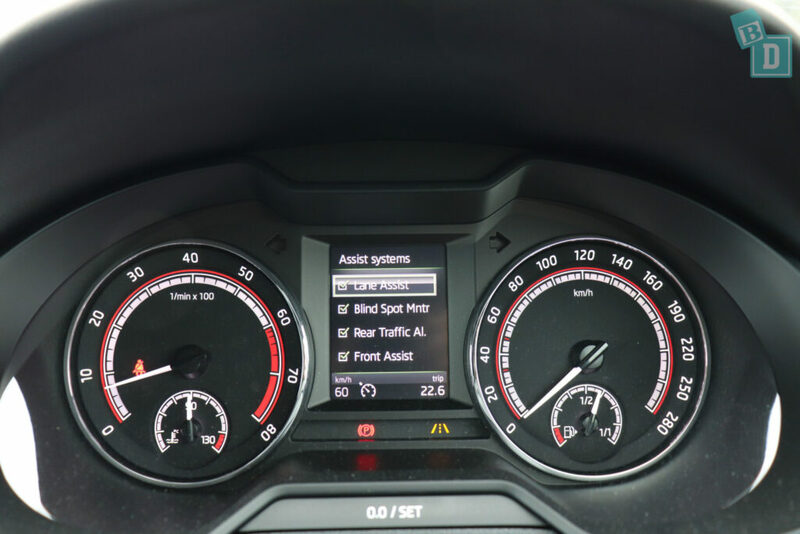 In the digital screen in front of the steering wheel are more menus where you can adjust the settings a lot of the safety features can be turned on and off there. The windows in the Octavia have quite a loud mechanism and they close with a thump which could disturb sleeping passengers! The doors are nice and quiet to open but definitely close with a thump too. The engine noise is quite good although I could really hear the tyres on the road surface. The brakes feel quite hard and responsive. It is a sporty feeling car to drive which isn't always a good ride for little passengers. 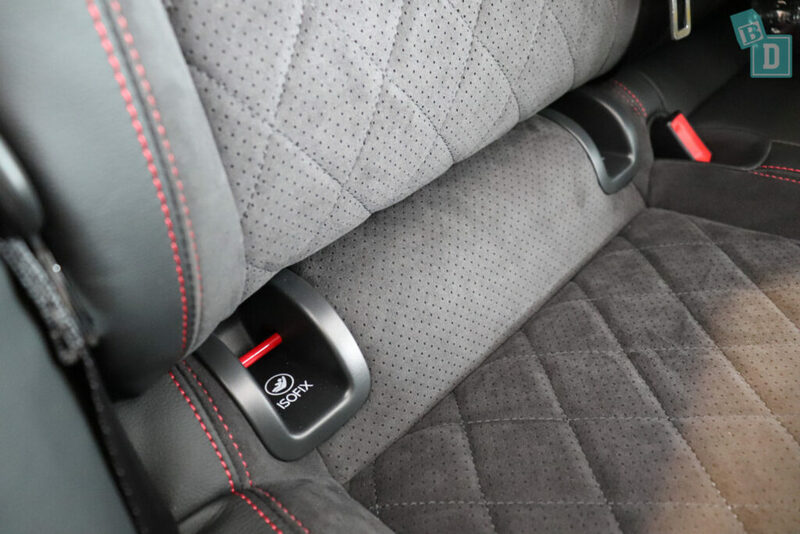 The Skoda Octavia has two ISO Fix points, one in each of the outer seats, within plastic guides that were easy to connect to. There are three top tether points. They are in the seatbacks, but I found I could not access them through the boot as it was too far to reach them, so I had to bring the seat backs forward to access them. The central seat's top tether point is situated just behind the central seat headrest and I found this to be very difficult to use because that headrest will only lift about 2cm and it is really difficult to attach the top tethers, and the headrest gets in the way of the strap adjustment on most forward-facing child seats. I don't think it would be so bad for rear-facing seats as their top tether straps tend to adjust at the sides. Sitting in the central seat is not as uncomfortable as I thought it would be. Your feet do have to straddle the hump in the footwell but actually because there is so much legroom it's comfortable and the backrest isn't too hard either. The seats in the Octavia were very sculpted so I found I could only fit two child seats into the Octavia. 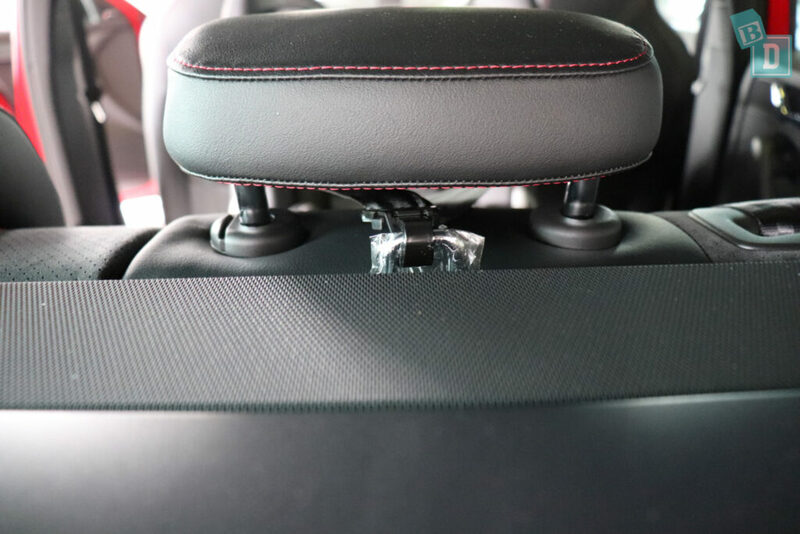 I installed the Britax Unity infant capsule rear facing and the Britax Graphene rear facing. With only one child seat installed there was room to feed Bub in the rear seats. With rear child seats installed there was 8inches of knee room for the front passenger in front of them. The seats in the Octavia look fantastic but they are quilted suede central panels which are probably two of the worst things for child spills and crumbs!! Lots of intricate stitching and suede for everything to rub into!!! Not very BabyDrive friendly!! 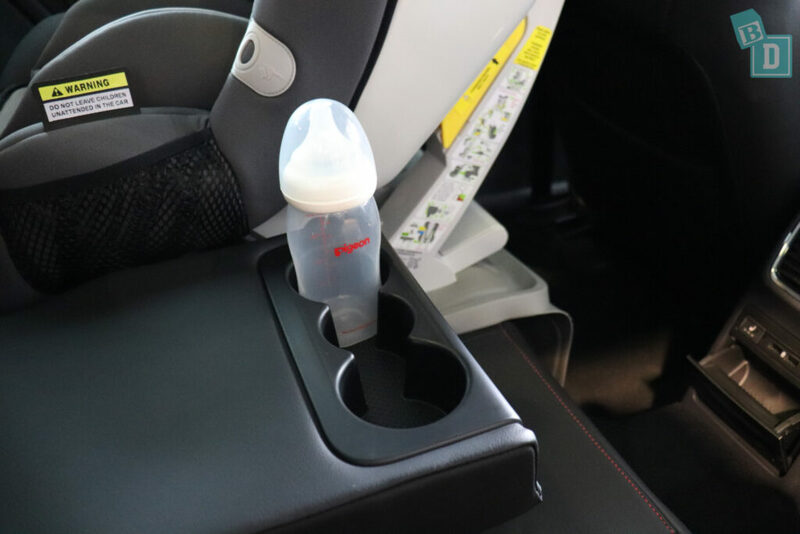 The seats in the Octavia are comfortable both front and back and I was surprised to find that the central seat was good for mum travelling next to an infant too. Tsecond-rowrow seats do not slide to adjust the legroom but there is enough space in the cab even with rear child seats installed. But I found I couldn't wear a ponytail with the front headrests! The steering wheel was adjustable in/out and up/down. There are four air-con vents in the front dashboard; two in the centre and one at either end. There are also vents in the back of the central console box for the rear passengers and two USB sockets as well! This is a great position for them so that I can adjust the rear air flow whilst driving. The air-conditioning in the Octavia has quite a gentle air flow yet I found it very efficient. The controls are on the main dashboard and are easy and simple to use. Visibility in the Octavia is not too bad, even with child seats installed. 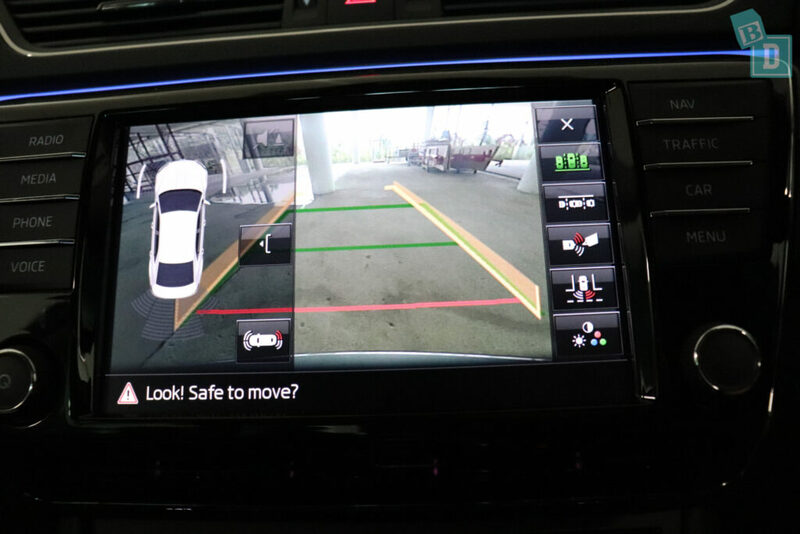 It is a long car so I used the reversing camera and mirrors a lot when parking. 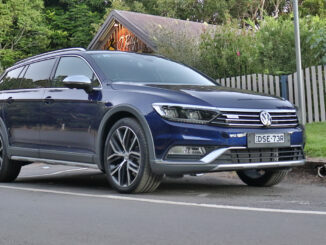 The Octavia has a hard ride that is quite bumpy for passengers, which I think is due to the sporty tyres. At least for the driver it is a smoother ride as you have the contact with the steering wheel to hold yourself firm from being lurched about! One thing I have noticed since being a mum is I hate it when I reach a destination or get home from being out and Tulsi has either done really well in the car or she is screaming her head off and I have done really well to keep it together for the entire journey (usually the latter!!) and it takes 10 minutes to park the car! It can be really stressful. Usually I dread when we get the big cars and utes as they take longer in our tight apartment block carpark, but the Octavia was easy to park and enjoyable to drive! There are handles above both back doors that were well positioned for hanging a child's toy to entertain rear facing passengers. 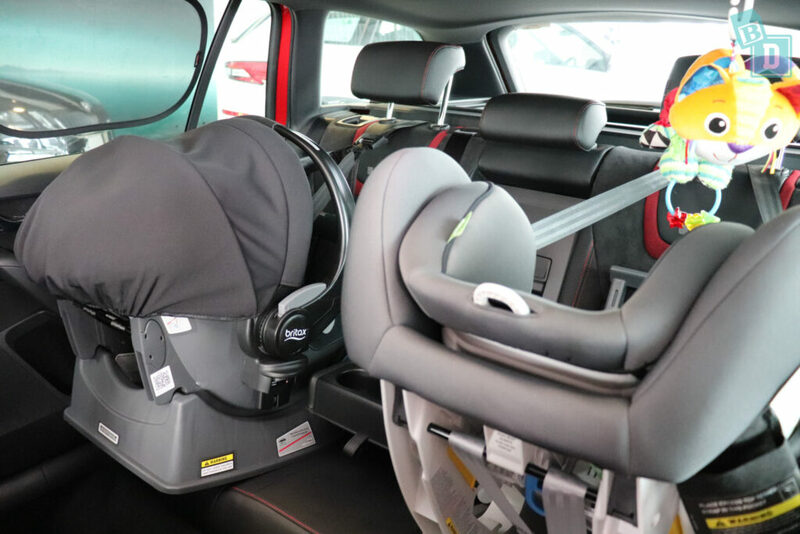 The rear interior lights can be controlled from the front, which is a great BabyDrive feature! The Skoda Octavia has a very sporty aesthetic inside, it is a bit like driving around in a teenage boy's bedroom!!! Lots of black, red and grey decor! 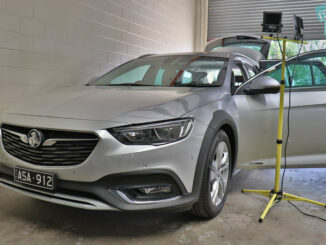 The Octavia I tested does have keyless entry and a powered tailgate. The Skoda Octavia has seven airbags as standard. Dual frontal, front side chest and drivers knee airbag and curtain front and rear airbags. The Skoda Octavia scored a five-star ANCAP safety rating in 2016. It got an overall score of 36.84 out of 37. Getting 15.87 out of 16 for frontal offset test, 15.96 out of 16 for side impact and pedestrian protection was rated acceptable.